KG3 IR Absorption vs IR Blocking filters? Same? - Page 2 - SolarChat! KG3 IR Absorption vs IR Blocking filters? Same? Re: KG3 IR Absorption vs IR Blocking filters? Same? FYI, the Astronomik Blue filter cuts wavelength below about 370-390 nm. I'll try to post the curve this WE. This is a quite good ERF filter for Ca K.
Another good ERF for CaK, is the EO 390 nm filter FWHM 40 nm, but it is very expensive. The K-line filter temperature rises to 35-40°C which is quite reasonable. Yes indeed. You have to think carrefully about where to position of the various filters. Welp, I'm proper undecided on what to do. Any suggestions on how to proceed from this point? I want to use my 393nm stack and the 395nm cut filter, but I have to find a way to manage the heat. The KG3 popped with the 120mm aperture. Any definitive suggestion on what to put in front of the KG3 to lower the heat from the 120mm aperture? All I know is that the filter I have is a 380~395 filter that blocks everything but that little patch. And then the two 393nm filters. I'm wondering if I can put a blue filter, like the blue CCD filter (2") on an extension tube and insert that into the focuser well into the light cone. Behind it, the 380~395 filter. Then after that either a KG3 or some other IR blocking filter. Then a 393nm in the skybender. Then a 393nm on the camera nose. I'm happy to try it out, but I need to get the blue filter or an ERF of some kind first, as I do not want to bust the 380~395nm filter as I cannot replace it. I just need to know it works, I can't keep popping KG3's! hah.
"" I have the solar focus directly on the second erf filter..."
Surely if your imaging, this final filter would be at some distance in front of the camera?? In my case about 30mm. I'm looking forward to your report, thank you for taking the time (and expense!) to share this info with everyone. I'm very curious about -> B-CCD filter (ERF 1) -> 380~395 filter (cut) -> 393 filter (Skybender) -> 393nm filter (Camera nose). I'm curious whether a KG3 needs to be inserted somewhere in there. I know I can't use a UV/IR cut filter, because when I put my Baader UV/IR cut filter inline with my original setup, I couldn't see anything as the UV filter cut off chopped the wavelength so I saw nothing with the 393nm filters. So I may need to put a KG3 or other 2nd ERF in there. Just not sure yet. Just trying to manage the cost. Too much extra stuff and I might as well buy a Lunt module or Quark CaH if it gets too close to those costs. Thanks for the K-line plot, I was looking for this the other day. 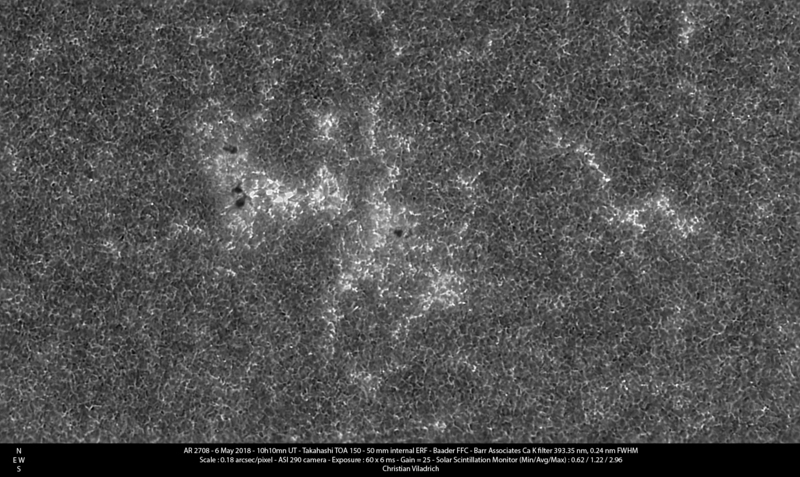 So today i let the baader planetarium b-ccd filter track direct solar focus for more than 4 hours, started at 1130pm. Just took it off. 100mm at f5 no other rejction filters added and it did not crack or break. This means it is rather enduring of heavy stress. I cannot measure glass expansion or optical performance characteristics but i can confidently say this filter will not break when it is close to the solar focus. I will stress test with an 8 inch f5 next. That's great news. I suppose that's why others are using them in PST CaK mods over the years. Was there anything in front of, or behind, the Baader B-CCD? Or was it just objective -> Baader B-CCD (in the focuser) -> something / Ca filters -> camera? Interesting, thanks for the update. I'll have to give it a try and see if I can use this in my focuser and then the skybender with the 393nm filters. With the Baader 2" B-CCD filter, with reflective surface and IR blocking, it serves great as a 2" ERF. I just used it all morning with a 120mm refractor and the heat was managed great. So I'm able to stuff the Skybender with 393nm filters and get back to it on a dime. Baader 2" B-CCD Filter (ERF) -> 370~395nm Cut Filter -> 393nm Filter (in Skybender) -> 393nm Filter on nose of camera. Heat is managed, works great. Transmission is great too. It really does reflect light back out too, which keeps the heat out instead of trying to absorb it some where. I show the reflection by putting my hand in front of the OTA and you can see the wavelengths reflected back out of the scope. Also, showing the transmission at the camera end, basically nothing visible as it's fully blocked and we can't see UV, but the camera can. Managed around 1 hour without any issues with heat with a 120mm aperture. Dunno why I even did that, I always do the dumb thing and put my hand in the light path to see if it's hot. It's usually hot on the business end. Was my first time experimenting with reflections from the objective to see if the filters were doing their jobs. They were! Was nice. I'm happy to be able to track and image without cracking a filter again. I have little time to waste during the summer in Florida with non-stop storming, so an hour of fooling with a filter is not worth my time. This blue ERF filter has really helped alleviate that problem so far! Just wanted to update it's been a few months, and the baader blue CCD filter with IR block has still been a champ, handling thermal load in my now 150mm refractor no problem, with the 370~395nm pass filter. The combination results in removing all the heat and still letting me image in both white light and near calcium light, or anything in the blue spectrum basically, without any special big ERF so far. Very interesting, Marty, thank you, I was looking for a blue ERF with the same purpose, the info you provided are very useful.